Devotion requires not the rejection of our material side, but its harmonization with our spiritual purpose. We can use our material abilities and resources in Krishna’s service. But these very assets that can help us move closer to him can also slow us down if we become proud of them. When such pride comes from our intellectual ability, it can be especially detrimental and deceptive. We can and should use our intelligence to study scripture so that we can apply it better and share it more effectively with others. But because spiritual culture naturally respects scriptural learning, we may often be praised for our scriptural study. And we may also intentionally or unintentionally seek such praise by memorizing and quoting bits of esoteric information from various scriptures. Such praise often puffs up our ego, which may subconsciously mislead us into believing that because we know so much, we are spiritually advanced. However, what builds us up spiritually is not information, but application. To apply the scriptural teachings, especially the fundamental teaching to turn our heart away from the world to Krishna, we have to exert our spiritual muscles. But the recalcitrant mind keeps going away from him towards worldly objects, including especially that most tempting worldly object, the ego. Our helplessness impels us to apply another fundamental scriptural teaching: we can’t discipline the mind on our own – we need Krishna’s help. When we beg urgently and fervently for his mercy, that humble acknowledgement of our dependence on him ends the ego’s blockage of the door of our heart, opening it for him to enter and enchant. 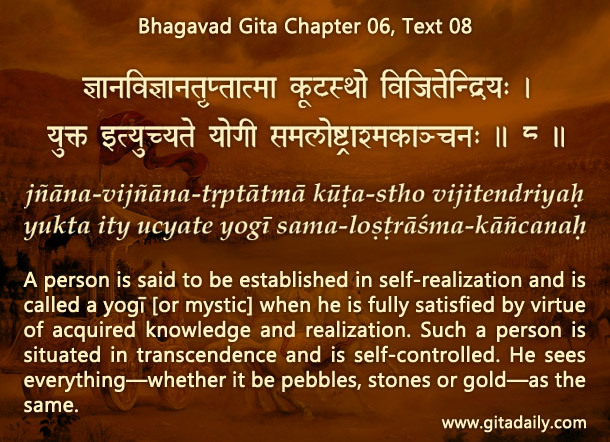 Thus, information of Krishna’s glory matures into realization of his beauty, and our heart finds contentment, as the Bhagavad-gita (06.08) indicates. Our worldly attachments subside and our devotional attraction increases, thereby building us up spiritually. Very beneficial article,Thank you prabhuji. Wonderful article for quashing the EGO and increasing our service attitude. The criterion for spiritual advancement is engaging 24X7X365 in service of Krishna and his devotees by thoughts, words and deeds and be able to make whatever required sacrifices happily and willingly for doing so. This realization is very very profound Prabhu. It is when we realize that we are helpless in front of the mind and the only way to make the mind our friend, is by pleading to Him, then we become humble. This is experienced every day when we chant and watch helplessly the power of the mind. With His help we can bolt the front door from the thief(mind) and open the back door for Him to enter. Thank you very very much Prabhu for this pearl.